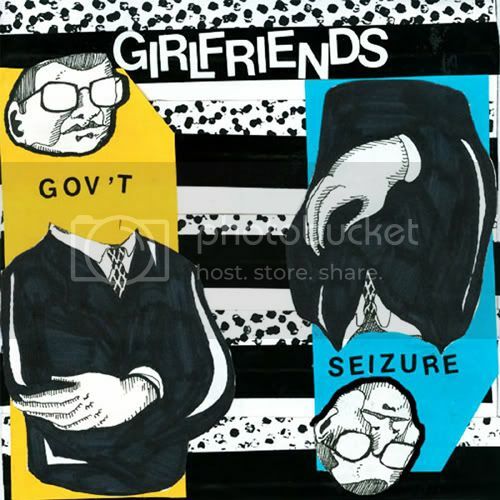 the new Gov't Seizure 7"
DISSONANT POP TRIO GIRLFRIENDS have their shiny, candy pop charm, but they've clearly got a dirty tattooed punk side as well. And we couldn't be happier, for the sound they make is both exciting and right-now. Tracks like "Creep Stuff" (above), interestingly, are strangely reminiscent of Rock 'n Roll's old school past - think the Zombies and the Kinks. And how much cooler can you get than bands that make great music, release it on vinyl AND on cassette? Girlfriends (Andrew Sadoway, Jen Dowty & Ben Potrykus) represent a celebrated Boston tradition in bands playing it loud and rocked it often. Somehow, despite all the noise, the band finds a way to be different and stand out from the crowd. It's an attractive package. (Is that where the band name came from?) Now you can catch them on the road for a US tour. The Next 40 Days sees Girlfriends play dates all over the USA (I kid you not, look at that aggressive tour schedule!) There are some pretty distant spots and late night drives ahead. I love it when artists put themselves on the line for their music! Why don't you go out and show them some love?